Successfully Added Mini Bluetooth Keyboard for Smartphones, iPad, iPhone, PS3, More to your Shopping Cart. Typing, chatting, and gaming just became easier than ever with this Mini Bluetooth Keyboard. This handy accessory is easy to carry around and works with most Smartphones, iPad, iPhone, Playstation 3, and many more devices, allowing for easy and convenient typing. This Mini Bluetooth Keyboard allows you to enjoy responsive, featherlight typing along with portability, and Bluetooth functionality everywhere you go. The sleek and slim design fits comfortably in your hand and allows for easy typing with its 49 soft keys, including a full QWERTY keyboard and complete with a space bar and number keys. This Mini Bluetooth Keyboard even includes a FN (function) key for twice the functionality, making everything easier than ever before. With its Bluetooth 2.0 compatibility, this Mini Bluetooth Keyboard works with most smartphone operating systems, including the iPhone 4 OS, Nokia Symbian (S60+), Android (certain devices, see below), and Windows Mobile OS(6.0+). Setup is quick and easy and in mere seconds your smartphone will be equipped with the ideal tool for texting, writing emails, chatting, web browsing, and even gaming. 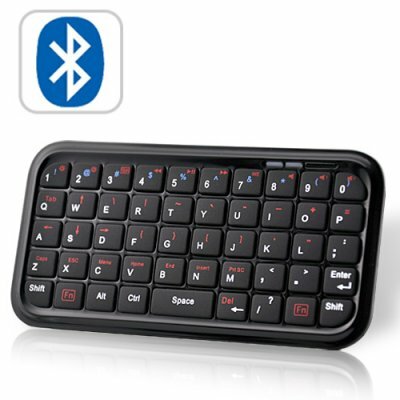 For those who need more options, this Mini Bluetooth Keyboard even works with the Apple iPad, Playstation 3, and Bluetooth-enabled Windows/Mac/Linux laptops and computers!